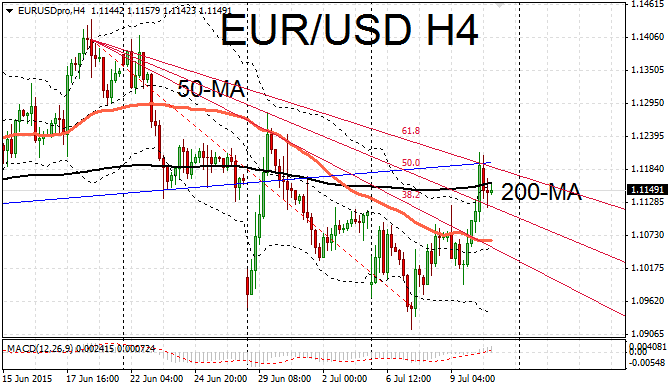 The euro rebounded on Friday with EUR/USD rising firmly back within the 1.1149 channel. The euro is experiencing some resistance around 1.1196 which coincides with the upper Fib resistance line (61.8% – see figure). 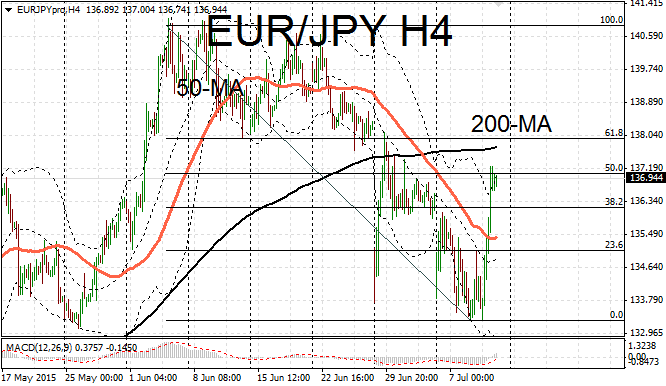 EUR/JPY also underwent a sharp upwards correction, rising to 136.94. 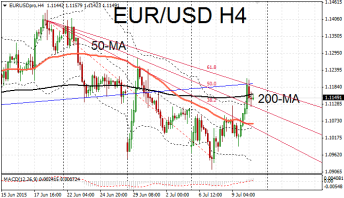 The next resistance lies between 137.92 and 137.69. Optimism was raised that a deal would be struck over the weekend so ending months of uncertainty over the future of Greece within the Eurozone. Greece faces going bankrupt within days unless it reaches a last minute deal with its EU creditors. As well as a deadline repayment of 3.2B euros to the European Central Bank, Greek banks will reportedly run out of cash by Monday if a last minute deal isn’t struck. An EU summit will take place today at which all 28 leaders of the union will aim to find a resolution to the Greek debt crisis. Overnight talks with Eurogroup finance ministers failed to reach a settlement after doubts were raised on the credibility of Greece’s latest offer. Athens is seeking an immediate 59B euro bridging loan as well as a write down on its 320B euro debt, much of which is owed to Germany. The latest proposal from the socialist Syriza party offers some of the tax rises and a schedule for privatization of state assets. It doesn’t however offer the kinds of structural reform and labor market liberalization that EU leaders believe is necessary for the country to emerge to growth again. This, most economists believe, is necessary if it is ever going to be able to repay its massive debt burden which currently stands at 178% of GDP.